In today's VetGirl blog, we interview Dr. Richard Goldstein, DACVIM (SAIM), DECVIM-CA, Chief Medical Officer at Animal Medical Center in New York City, NY on Lyme disease. 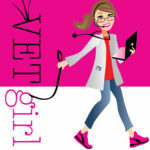 If you're not sure if you should be vaccinating for Lyme disease, this VetGirl Podcast Blog is a must! More importantly, learn specifically about how the Lyme vaccine works directly against OpsA. What about the Idexx SNAP 4DX Plus - just how do we interpret that blue dot? Check out this blog to learn how to help prevent lyme nephritis! The hospital I work for recently switched to using antech which has the accuplex test and they keep reporting chronic Lyme. I also have owners from other hospitals coming in telling me they have been diagnosed with chronic Lyme so occasionally they have a lameness or such that acute up for it. I was not under the impression that Lyme could really become chronic but instead can be reinfected. Any comments to clarify this terminology? Thanks. There is definitely some concerns about chronic manifestations of the disease. That said, a majority of dogs in North America test positive for Lyme disease without ever developing clinical signs. When in doubt, if it’s a Golden retriever or Labrador retriever, I’d recommend treating with doxycycline. If it’s not one of these breeds at risk for Lyme nephritis, I’d consider testing for proteinuria and basing the decision to treat on that. If clinical, we’d treat! hope that helps!